Three watercolor cat paintings from my Cats of Karavella Atelier. The first one is a Doll Faced Himalayan cat painting about Teddy Bear who looks like a real sweetheart! But behind the innocent baby face, of course there is a naughty boy. Which of course is not a big surprise, as we could say the same about most of our fur babies, but that is why we love them! Another comissioned watercolor painting about a lovely calico cat Tinks the Minx, who has beautiful mesmerising eyes, and who is always ready for a good tummy rubbing! And finally a double portrait titled Sleep Well Little One, because I have to admit, that I have a thing for sleeping cats. A sweet moment captured on my watercolor painting, the orange tabby Winslow protecting the dream of little Leo. A new group photo about three watercolor cat paintings. A portrait about Astro, the little tuxedo kitten who like to smile, Cleo the orange tabby, who has gorgeous amber eyes, and a lovely couple of a tabby cat and one with the richest brown fur, titled Dream Guardian! A new group photo about my pet portraits, from Karavella Atelier. Watercolor portrait about Abby, the Lynx Point Siamese cat, a Silky Terrier painting inspired by the beloved Leo, a custom order about Ceci, the Blind Kitten, another dog portrait about Jack the Doberman, and finally a Bicolor Ragdoll Cat Painting inspired by Dexter. If you would like to volunteer to be my next cat model, please visit me, and follow my Cats of Karavella Atelier Facebook Page, send me there photos of your cats in any of my post comments. I would like to introduce you some paintings from my new Cat Portraits Collection, which I started in the beginning of December, in 2017. I am making fresh watercolor paintings about photographs, which I receive daily in my Cats Of Karavella Atelier Facebook Page from my followers. They send me photographs without any compromise, so in case I choose their cats to be my models, it is not compulsory to buy the original painting, but it is possible, if anybody would like to support my art. All cat paintings I make, I upload to my Online Art Gallery, which is my portfolio, they will be also available as prints and related products in several options such as featured on home decor, life style, apparel items. On this group photo, you can see a portrait of a handsome Russian Blue Cat, a portrait about Galaxy the pretty Calico, Miss Lucy, the long haired tricolour cat, Sox the tabby, and another cat painting titled White Cat Affection. If you like my paintings, and you would like to volunteer to be my next cat model, please visit me, and follow my Cats of Karavella Atelier Facebook Page, send me photos of your cats in any of my post comments. I am also open for custom orders, for inquiries please contact me at my Online Art Gallery! 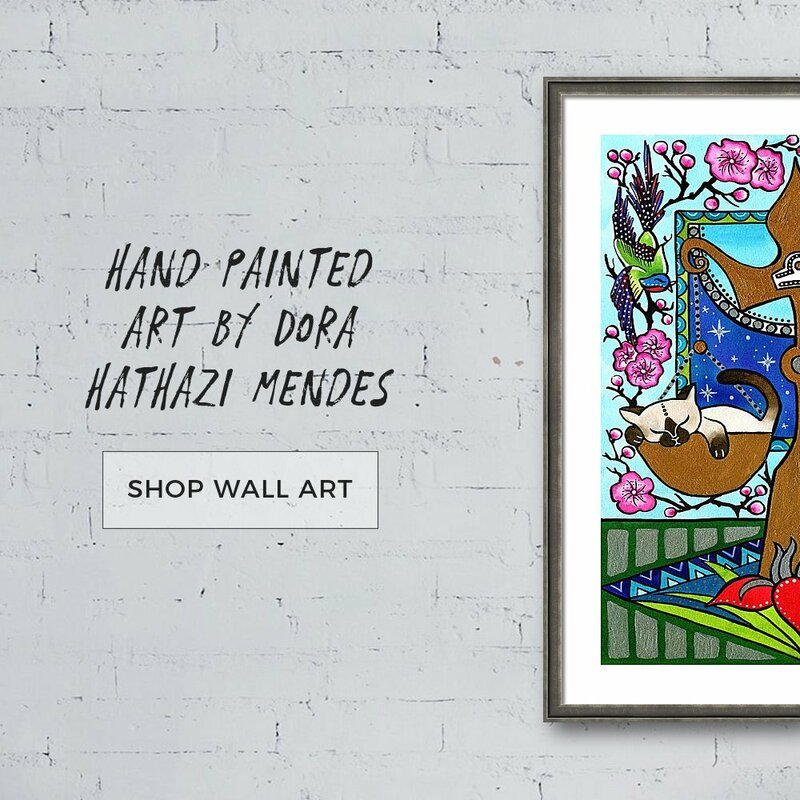 Please visit my Cats of Karavella Collection to find colorful, cute cat paintings and related unique products for yourself, to your friends, and family! Use my code DVNVYX at check out for additional discount! Today is free shipping from my Karavella Atelier online art gallery, including my Cats of Karavella Collection Any products, any size, any destination on the World. And if you use at the check out my Coupon Code DVNVYX which valid on every products and prints till 31 of December, you will have additional discounts! Free shipping is valid on my available original paintings too, with 50$ Off from the original listed price. Today I also launched my Christmas Cats greeting card collection with 5 little whimsical cat painting. If you buy all 5 from the set and use my code DVNVYX, one card will be also free! My code and free shipping is valid for every other themed paintings too! Please visit my gallery, and save on the shipping to choose lovely gifts and presents for your friends and family! Thank you for sharing, and for supporting my art!